1.Preheat oven to 350°. Rub steak with soy sauce, sesame oil and salt and pepper to taste; let stand at room temperature 15 minutes or refrigerate up to 4 hours. 2.Heat large skillet over medium-high heat; add steak and cook 5 minutes or until browned, turning once. Transfer steak to rimmed baking pan; roast 7 minutes or until internal temperature reaches 135° for medium-rare. Transfer steak to cutting board; loosely cover with foil and let stand 10 minutes. 3.In large skillet, cook riced veggies as label directs. 4.In small microwave-safe bowl, add 2 tablespoons water and broccoli; cover with damp paper towel. Heat in microwave oven 1 minute or until crisp-tender. 4.Slice steak across the grain. 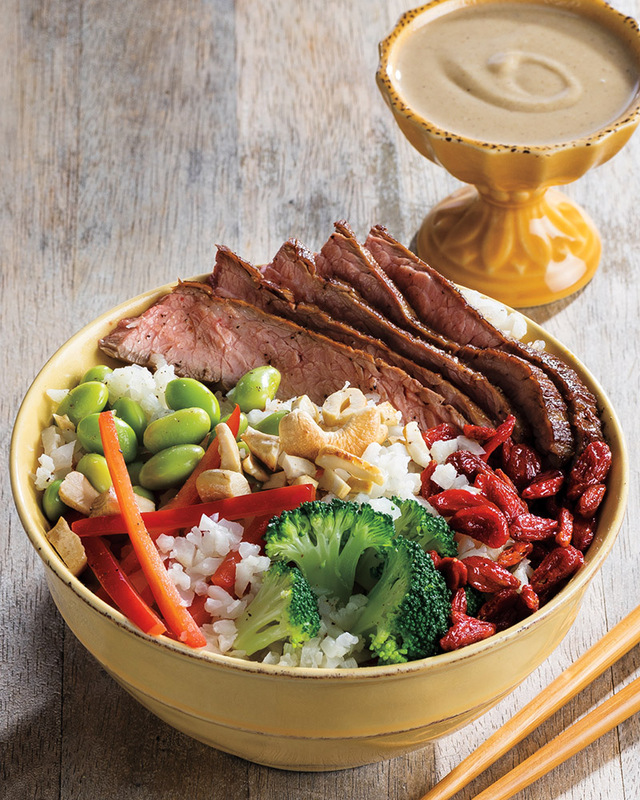 Divide riced veggies mixture into 4 bowls; top with bell pepper, goji berries, cashews, edamame, steak and broccoli; drizzle with tahini. Add another layer to the bowl with fresh spinach, arugula or turnip greens. > Use coconut aminos as a paleo, gluten-free soy sauce alternative to give your dish that unique umami flavor.